April 13, 14 & 15, 1961. Crime galore stalks the stage at the Barn Theatre, Southwick, this week-end, where the Young Wick Players are presenting Frederick Knott’s thriller Dial M for Murder. A small but able cast, directed by Brian Moulton, bring a measure of realism to their acting and the play has some exciting moments. But on the opening night there were too many forgotten lines, and the pace slowed almost to a standstill on occasions. There is an ‘eternal triangle’ theme, interwoven with the evil plan of a young husband to have his wife murdered so that he can get his hands on her money. The scheme misfires, however, and the assailant he has hired ends up stiff on the floor – killed by his intended victim. The play’s concluding moments, in which the husband is finally cornered by the police, are vividly enacted. Frances Moulton and Adrian Hedges as Sheila and Tony Wendice, the London couple keeping up a veneer of being happily married, act with marked ability and exploit their opportunities for drama to the full. Ralph Dawes as Max Halliday, the third point of the triangle, also acquits himself well, and John Robinson, making only his second appearance for the company, convinces as captain Legate, the hired murderer who gets a taste of his own medicine. There is a strong incisive portrayal as the astute Inspector Hubbard. The final performance takes place tonight. 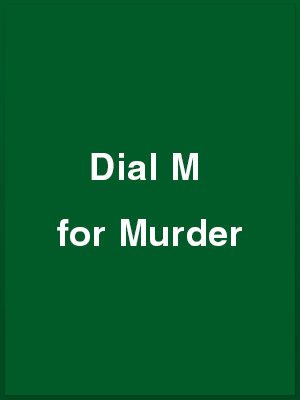 DIAL M FOR MURDER by Frederick Knott, has had an extended season on the stage and has been filmed and televised. It is one of the best thrillers of post-war years. When Young Wick Players decided to produce the play, their director for this particular venture, Mr Brian Moulton, must have realised that the plot was comparatively well known and that it had received a wide variety of presentations. It came as a shock, however, when the play opened at the Barn Theatre, Southwick Community Centre. last Thursday to see it was offered to a sparse first-night audience straight from the book, devoid of gimmicks and with the minimum of props. The cast, with the exception of the two principals, Frances Moulton and Ralph Dawes, were far from sure of their lines and spoiled several entrances which detracted from the impact of the dramatic effect. Towards the closing scene, when the condemned but innocent woman, played by Frances Moulton, was due to make a dramatic entrance – the audience having been led to believe that she was languishing in a condemned cell – she was plainly visible to the people sitting on the right hand side of the hall. This could have been easily prevented by ensuring that the curtains of the French window were properly drawn. On such tiny details does a production fail to stand the test of presentation by an amateur cast. Frances Moulton as Sheila Wendice was excellent, and the scene where she strikes her assailant to the heart with a pair of scissors was theatre at its thrilling best. Her subsequent test as a stricken wife, the target of her husband’s venom, was well-nigh perfect. The fact that Mrs. Moulton had been unwell in the weeks preceding the staging of the play, made her performance double commendable. Ralph Dawes, her lover, crime-writer and author, was the steadying influence in the emotional battle between a jealous, enraged husband and a sorely puzzled wife. Adrian Hedges as Tony Wendice, the villainous husband whose vile plots were revealed in a dramatic ending, lacked confidence, obviously engendered by not having a good grasp of his lines. Barrie Bowen, as Inspector Hubbard, was guilty of the same combination of errors to a lesser degree but he grew in theatrical stature as the play proceeded. John Robinson as Captain Lesgate, the man employed by the jealous husband as a means of getting rid of his wife, was calmly philosophical when he might have been horrified. He appeared to accept the offer of £1,000 to murder a woman as he might have accepted the knowledge that he had parked his car in a ‘no-waiting’ area. But he knew his lines and moved well on the rather small stage. The programme showed that Mary Chinchen was prompter. It is a good job she kept her eyes glued to the words of the play. It was not, taken as a whole, up to the usual standard of Young Wick Players. The voice of the prompter, the long-drawn-out opening scenes, the failure of two or three of the cast to remember where they had dropped a vital key, or where the proper switch was for a particular light all detracted from the production. Perhaps we should be charitable and put it down to first-night nerves. The Young Wick Players added leaves to their laurel crown with the production last weekend of Frederick Knott’s thriller Dial M for Murder. Young Tony Wendice hires the weak and profligate Captain Lesgate to murder his wife Sheila for her money, and because of her affair with Max Halliday. The production was notable for the fine performance of Barrie Bowen as the police inspector. It was the most authentic representation of such a character that I have ever seen. There was firmness and a complete command of the situation but allied with courtesy and with no trace of the completely uncharacteristic hectoring that many actors imagine to be the manner of professional police officer. Adrian Hedges as Tony Wendice ran him a close second. He is an actor of ability and versatility, and took this self-important young man with the decisive manner, in his stride. Captain Legate was played by John Robinson and well played, too. It is, perhaps, a permissible criticism that the weakness of the character was brought out a little too much , so that one doubted that he would have the ‘guts’ to carry through a cold blooded murder. Max Halliday, the writer of crime scripts just returned from the USA who hits on the manner of the attempted murder, was played in good style by Ralph Dawes. The weakness of the production lay in Frances Moulton’s portrayal of the wife, Sheila. It was not that her performance was a bad one, but that it was of lesser quality than the men of the cast. Inevitably this cause a certain watering down of the overall effect. Brian Moulton has done an excellent job of production and some not-too-easy stage movement was well handled. Ross workman was stage manager, and John Chatfield had contrived sound effects that added considerably to the atmosphere of the play.